My friend made this for me after she had taken an Ayruvedic cooking class. I absolutely fell in love. It’s easy to make and it’s a great family style dish that can be made vegan or not. 1. Heat large frying pan or wok and add Coconut Oil (or Ghee). Make sure oil is heated before adding onions, keeping moderate temp until they begin to caramelize. 2. Then add CCF and continue to stir unit seeds begin to brown and pop and onions begin to brown. Add Garlic Ginger paste before onions finish. 3. When the onions caramelize add Tumeric and Cayenne. Stir and add bananas and water. 4. Continue to stir until bananas begin to thicken in pan. 5. 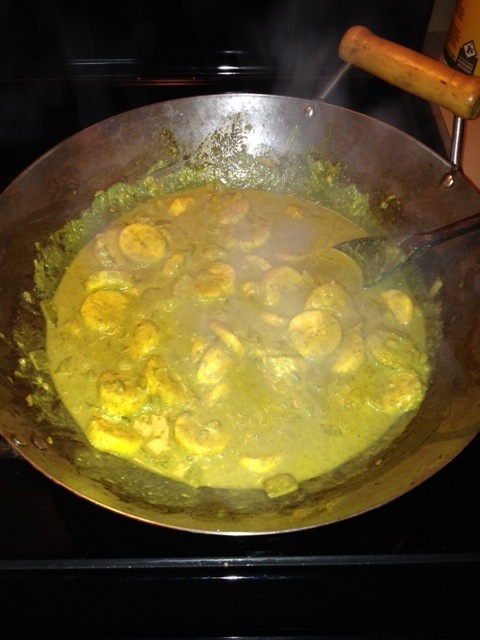 When bananas have dissolved remove from heat and add coconut milk. 6. Return pan to low heat add Garam Masala and Lemon (if used yogurt). Simmer low for another few minutes. 6. Remove from heat and allow to thicken before serving.